Celebrate your commitment devotion with this endless circle of gems. Square intense blue created sapphires alternate with princess-cut CZ in a sterling silver over yellow gold vermeil channel-setting. 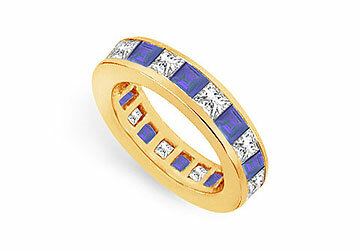 This eternity band has a total gem weight (TGW) of 3.00 carat. Being a September birthstone it is an ideal gift for any September born.